After a recent conversation with someone who works in the Dental Industry on development and learning, I learnt that they have to complete a number of CPD (Continuing Professional Development) hours a year and a minimum number over a 5 year period. Following this I carried out a short investigation into the amount CPD requirements that were recommended across different industries picking on some of most obvious top of the head ones. 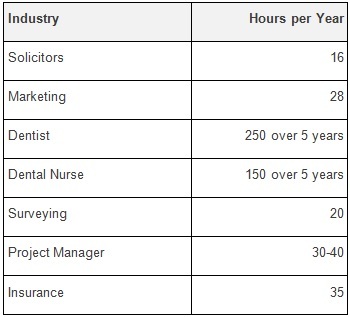 Most of these are from professional bodies that people in those industries can join, some are a must join such as medical professions and there is a mandatory requirement to do the CPD or you will be struck off, or no requirement to join and therefore no requirement to complete the number of CPD hours required by that body. In the world of IT there is no requirement to join a professional body nor to carry out a number of required CPD hours a year. There is no right answer to the number of hours that you should be performing, however looking at other industries and especially those in the Project Management space which is a role that works closely with Architects – 30-40 hours annually is a good figure to aim for. I would suggest that the wrong answer though is not doing any hours. So what type of CPD should someone be doing? Some industries split this into Verifiable and Non-Verifiable. Attending a workshop, webinar, Lunch and Learn would be classed as Verifiable as your attendance can be recorded. Non-Verifiable would be something like read an article on a web page. The BCS (British Computer Society) have a view around the different types of CPD http://interact.bcs.org/cpd/Types%20of%20CPD.pdf which contains a number of categories and measures for learning. This is based around a core CPD Cycle. Although there is no set number of hours for the BCS to gain accreditation and membership you do need to show learning and development annually. So why bother with CPD? This is easy to answer in that if you don’t, others are! 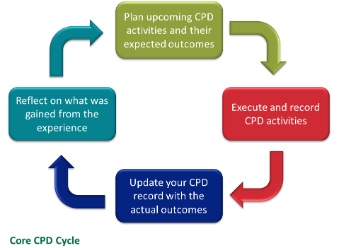 Planning an amount of CPD a year will help to keep you fresh and current within your field. I will run the survey for a while then publish the results in this blog when collated.